Protection, Reliability, Speed, Power, Maturity. Finally, everything you need all in one place. The Internet is very dynamic and constantly evolving. As a result, today's neat toy becomes tomorrow's essential tool. Therefore, as the IPAD continues to evolve, we respond to the demands of the marketplace adding new features and functionality to help fulfill the IPAD's mission as a powerful core connectivity and protection appliance. What's the difference between Upgrade and Update? Periodically we release major new versions, called Upgrades to the IPAD-OS, the core operating system that runs your IPAD product. These major versions add significant new features and abilities. 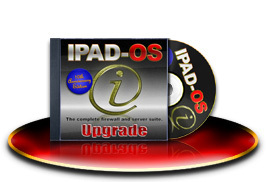 Every IPAD owner with a valid IPAD-OS serial number can purchase these upgrades. On the other hand, Updates fix bugs that were found after the major release was shipped and are often made available at little or no cost. You can find out more about updates and how to install them on our upgrade page. Updates for bug fixes and small improvements are normally made available at little or no cost to all registered owners of the current IPAD release. The cost of an upgrade with major changes depends on the features it contains. Each upgrade may be purchased separately or through a Software Protection Policy. It is the goal of the IPAD development team to release new major versions of the IPAD-OS at timely intervals so every IPAD owner has access to the latest and best. This can cause an extra financial burden for the average IPAD owner and is why the IOA has developed the Software Protection Policy. The annual policy will authorize your IPAD for all updates and upgrades released while your policy is active. This helps our corporate and government members plan an annual budget and know that the price of staying current will never increase as long as the policy is active. To get a Software Protection Policy for your IPAD, visit our order page. Copyright © 2000-2019, IPAD Owners Association, Inc. All Rights Reserved. IPAD is a trademark of eSoft, Inc. used under license by IPAD Owners Association, Inc.
iPad is a trademark of Apple, Inc. for an unrelated consumer tablet device.